The kitchen is, and always has been, one of the most important rooms in a house. As such, it is one of the most frequently renovated and remodelled rooms. Kitchen renovations can be expensive, especially if you are bringing in professionals to do most, or all of the work for you, which is why it is important to know how to budget for the project. 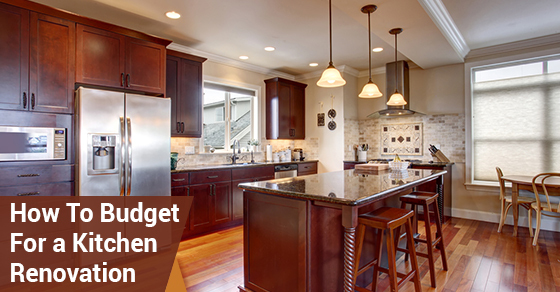 Below are some tips for budgeting your kitchen renovation and saving money. This sounds like common sense, but you would be surprised at the number of people who say they are going to stick to budget and then get carried away in showrooms or online. The best way to stay within budget is to take a cold, hard look at your finances pre-renovation. Ask yourself how much you can realistically afford to spend, write that number down, put it up on the fridge even, and know that just because you are in love with particular finishings, backsplashes or any other features, doesn’t mean you can afford them at the moment. If you think you will be staying in your current home for at least another ten years, and you have the money to spend, you should consider investing in a kitchen that will provide you with the most possible enjoyment and comfort, and that will stand the test of time (both aesthetically and functionally). If you have been moving around from house to house over the last decade because of your career, or for other financial reasons, putting a lot of money into a kitchen that you might not end up using for a long period of time, and which is not guaranteed to add its worth in resale value when it comes time to sell, might not be the best idea. Instead of spending money on all new cabinetry in your kitchen, why not consider just replacing the knobs and giving the existing cabinetry a new paint job. Things like these can radically alter the appearance and feel of an old, out-of-date kitchen, and will cost you so much less than buying new cabinetry and having it installed. Kitchen renovations should be exciting. You shouldn’t be constantly worried that you are spending too much money, or that you are going to get halfway into the project and find out you don’t have enough money to continue. Keep the above budgeting and money saving tips in mind and build your dream kitchen without breaking the bank.